Energy your enterprise and your work with thel latest intel core processors with up to 4GB of excessive-speed ram options, provides power and performance.store and get right of entry to presentations, files and media without fear of space boundaries with up to a 1tb hard drive, with the flexibility to assist as much as 6tb hdd to hold the entirety you need close to hand. Disclaimer : Dell Vostro 3669 Core i5 7th Generation Desktop Computer 4GB DDR4 1TB HDD price in Pakistan is updated on daily basis and rate/price for Dell Vostro 3669 Core i5 7th Generation Desktop Computer 4GB DDR4 1TB HDD is valid for all cities of Pakistan included Islamabad, Rawalpindi, Lahore, Karachi, Faisalabad, Peshawar, Sialkot, Quetta etc. 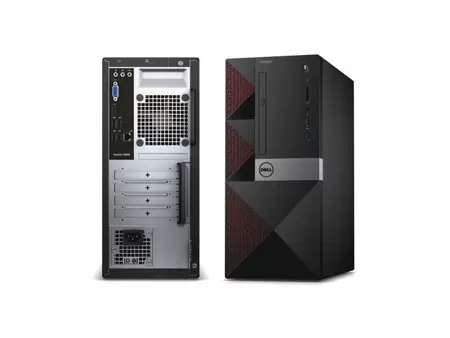 Dell Vostro 3669 Core i5 7th Generation Desktop Computer 4GB DDR4 1TB HDD price depends on many factors thats include the price of dollors, manufacturar price and import cost and duties etc. Our team entered specs from diffrent resources and not responsible for any typo error in specs for Dell Vostro 3669 Core i5 7th Generation Desktop Computer 4GB DDR4 1TB HDD, please report any such error in bug report panel for Dell Vostro 3669 Core i5 7th Generation Desktop Computer 4GB DDR4 1TB HDD. Dell Vostro 3669 Core i5 7th Generation Desktop Computer 4GB DDR4 1TB HDD price in Pakistan.